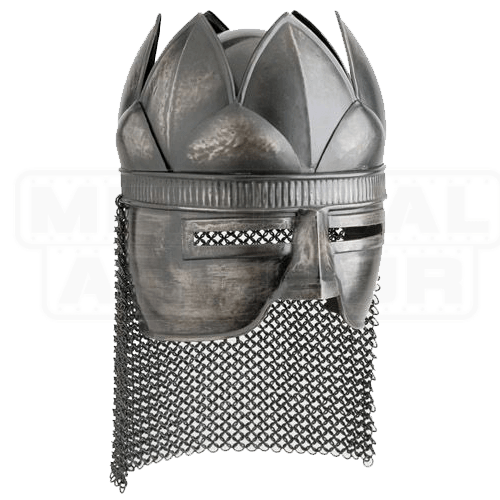 Worn by Thorgrim during the course of the movie, Conan the Barbarian, the Conan the Barbarian Helmet of Thorgrim by Marto is a barbarian-influenced helm that provides not only adequate protection, but also a small level of intimidation. As any barbarian would tell you after suffering one too many blows to the head, helmets are important. Not only can they look intimidating and powerful, but they also protect the vitally important head from any number of violent blows that could instantly ruin a warriors best day. 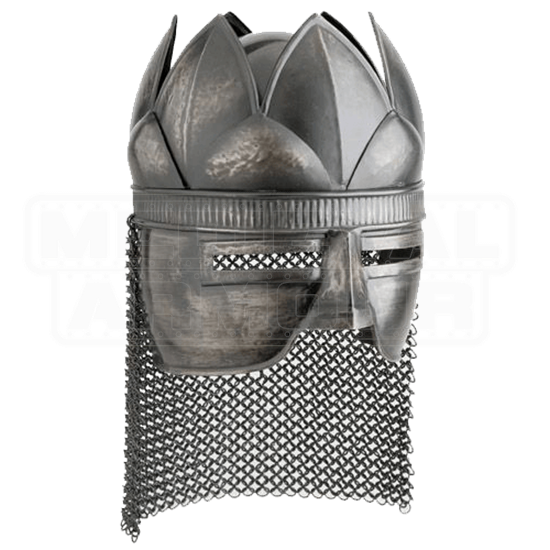 This helm is a decorated metal skull-cap with a visor placed over the upper half of the face, while a chainmail extension falls from the back to provide slight protection to the back of the neck. A painstaking recreation of the helm worn by Thorgrim during the movie, Conan the Barbarian, the Conan the Barbarian Helmet of Thorgrim by Marto is a collectors dream.